The Askew magic continues, the brand new EP from Ego Trip is released today featuring Courtney Askew-Conti on vocals and guitars and produced at REDdot Studios by the man himself, Steve Askew. After a few months of re-incarnations and instrument-swapping, Ego Trip’s lineup finally took shape in September 2011, settling on a four-piece consisting of former schoolmates Mikey Ciancio, Ollie Smith and Courtney Askew-Conti, together with Adam Murphy – a previous bandmate of Courtney’s. Ego Trip have made numerous appearances on such radio shows as BBC Three Counties Radio, Luton’s Diverse FM and Milton Keynes’ Radio MK as well as playing gigs extensively in various venues around the area, including a county final slot at MMG’s Battle of the Bands. 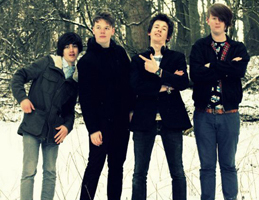 Empowered by their new debut EP produced and engineered by Steve Askew at REDdot Studio, along with a consequently rapidly-growing fanbase, Ego Trip are entering the 2012 with a spring in their step, expecting much hard work, regular gigging and writing more new material. The year looks promising for bigger and better things.